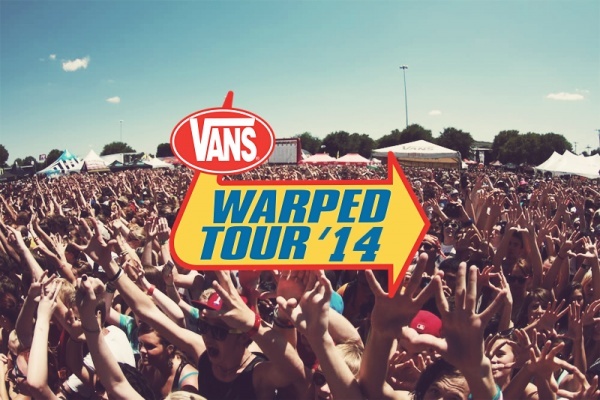 The Vans Warped Tour is almost here! As the tour enters it’s fourth week this summer, it has almost arrived on the east coast, with plenty of dates for nearby Penn Staters to attend. This is the 20th anniversary of the tour, and it has been bringing people together all across the country every summer with one main goal: to enjoy music. With over 100 bands performing at each date, concert-goers have a lot to choose from when they attend. Bands span all genres too, from punk to hip-hop to heavy metal to ska to electronic to radio rock. The 2014 Vans Warped Tour has a huge number of artists including such acts as: 3oh!3, All Time Low, Air Dubai, Bayside, Beartooth, Bowling for Soup, Breathe Carolina, Echosmith, Enter Shikari, Every Time I Die, Four Year Strong, Issues, Less Than Jake, Mayday Parade, Mod Sun, Of Mice and Men, Parkway Drive, Pvris, Real Friends, Saves The Day, Sleeping With Sirens, Stray from the Path, The Devil Wears Prada, The Maine, The Ready Set, The Story So Far, The Summer Set, This Wild Life, We The Kings, and Yellowcard. State In The Real will be attending the July 6th date of Warped Tour at the PNC Banks Arts Center, bringing you live tweets, pictures, coverage, and hopefully some great interviews. But if you’re looking for something to do one day this summer and want to experience the Warped Tour for yourself, definitely come to a date near you. The line up features more than 100 bands for the whole tour, and there is something for everyone here. Tickets usually range from $30-$50 depending on the venue, which is a small price to pay to see lots of good music. Check out some of the local dates below, and check out the full listing/buy tickets here!